Note taking has changed over the years. I am/was an Old School Big Chief Tablet note taker. Well, maybe not that old school, but old enough to know that paper and pencil notes are invaluable when your head is filled with details you may need later. These days, I'm feeling pretty Hi-Techie with my note taking Tablets. It's the best of both worlds...the old and the new. I still rely on a spiral notebook to record the details...especially if it's a new project. Often I will include fabric swatches, who it was made for, costs of materials and time it took to make. Now, as for the other tablet, it's the 'Bomb' or my 'Jam'...as they now say rather than my old standbys...neat and cool. 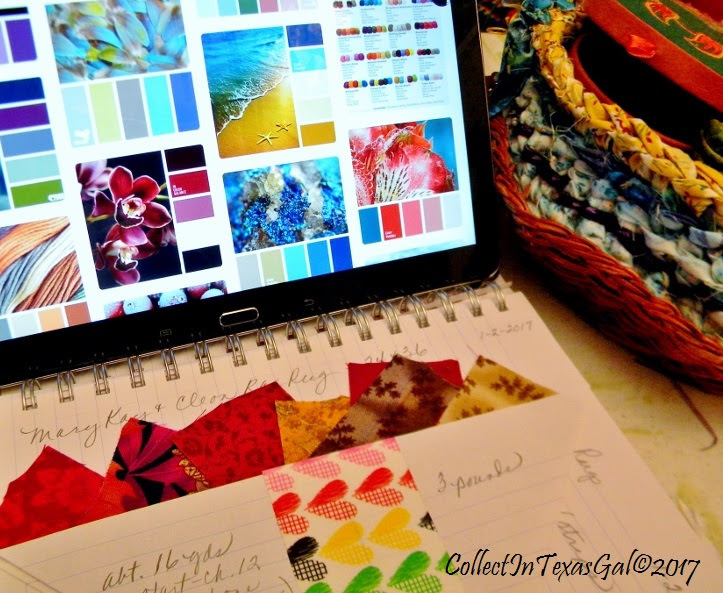 It truly is an invaluable tool with it's quick access to any and everything imaginable...including Pinterest....my go to Notebook! 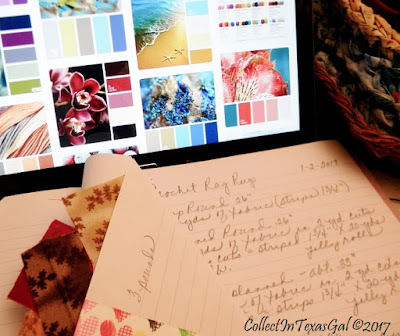 For this post, I am referring to my Color Combo Board on Pinterest and how I use it for color selections....in and out of my 'Comfort Zone. My 'Comfort Zone' is a balanced and coordinated composition. 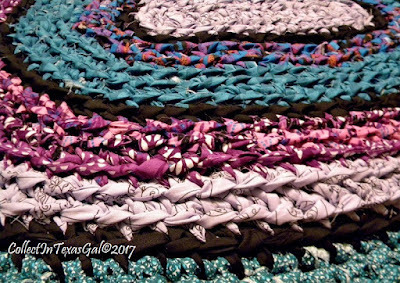 I approach most projects whether they be quilts, jewelry, clothing, or in this case rag rugs, in this traditional mode. For me it is innate...or a built in way of putting together colors. Here's how I roll with it. 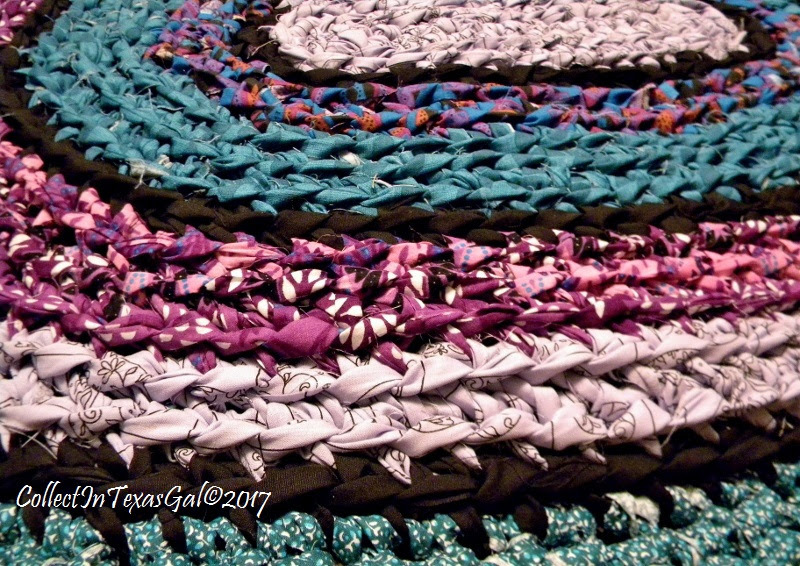 First I choose a 'Focus' fabric with multiple colors. 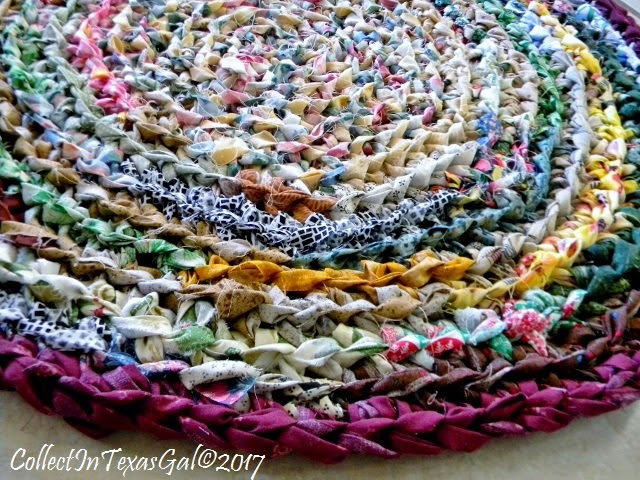 To that I combine as many coordinating colors as I need for the project...in this rug it was 4 plus the popper...black. Then, in the making, the transition of color changes and number of rows are balanced and as seamless as possible. Out of my 'Comfort Zone', is the 'Scrappy/Random' method of putting together colors. I have to say that in many instances the finished project turns out to be my favorite. Although it looks quite random, there are some color rules I can't help but follow. Mostly choosing lights and darks appropriately and making transitions for a blended look. In My Color Comfort Zone! color comfort zone is fast and true. But then I'm sure it's fun to sometimes throw in a curve ball color and see if it works. That's true in clothing choices. Every so often I'll grab crazy socks or something that sorta clashes - by the end of the day, the eye has accepted it. I call those curve balls...zingers, and they are often the thing that makes any and all other colors pop! Crazy socks....yeah...that's the ticket! I saw a penny rug at Concho Confetti yesterday, and thought about your rag rugs.